After two weeks of silence it is time for another links of the week. 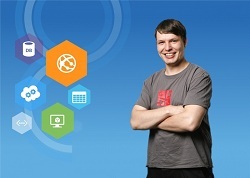 This week I have five sites covering Windows Azure which should be interesting for you. The first one is a good example of how you could deal with Big Data in Windows Azure – Weather Forecast on Windows Azure. I first saw this demo on the Windows Azure Train-The-Trainer in Amsterdam during TechEd Europe earlier this year and I’m very happy that this demo still exists. Earlier this week Microsoft announced that they will reduce the costs for using the Windows Azure Storage. With that they are following Google and Amazon, which also reduced the pricing for their cloud offerings. During the last weeks I also introduced the Windows Azure Mobile Services in some videos (recorded in German for the Windows Azure YouTube channel). Now Chris Klug has written a nice introduction to the Mobile Services, which I can recommend to read. Two other remarkable articles come from Josh Twist and Scott Guthrie. On the one hand Josh has written a tutorial how you could access your Mobile Services data from Excel. At the other hand Scott explains some updates to the Mobile Services iOS SDK – which now comes with Push Notifications. This entry was posted in English, Links of the week and tagged Links of the week, Windows Azure, Windows Azure Mobile Services on December 9, 2012 by Jan Hentschel.